Turnips are root vegetables that have less than a quarter of the carbohydrate of potatoes, and so are great choices for people who follow a low-carb diet. Turnips are members of the same plant family as cabbages, kale, broccoli, and cauliflower (cruciferous vegetables). The strength of the flavor varies but becomes milder with cooking. Turnip greens are also nutritious and another option when you're looking for a leafy vegetable. Do you find cruciferous vegetables to be bitter? You probably have a genetic variant that allows you to taste a certain chemical (phenylthiocarbamide) which tastes bitter. No studies of the glycemic index of turnips have been reported. There is one study of rutabagas, which are similar. The glycemic index for that study was 72. The glycemic load takes into account the amount of the food that is eaten and how it affects your blood sugar and insulin response. A value of less than 10 is considered to be low. 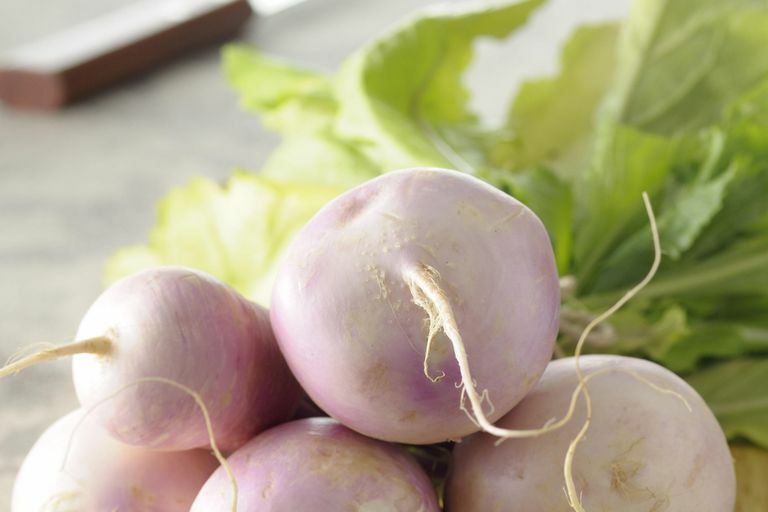 Turnips are an excellent source of vitamin C, a very good source of fiber, and a good source of potassium, manganese, calcium, and vitamin B6. Turnips are also cruciferous vegetables (also called brassicas or cole crops). Cruciferous vegetables are high in glucosinolates, which are phytonutrients thought to be helpful in protecting our bodies from certain types of cancers. They are broken down in the body into indoles, nitriles, thiocyanates, and isothiocyanates. Studies in humans as to the benefits against cancer have had mixed results. Glucosinates also has antimicrobial and anti-inflammatory properties. Turnips can be cooked almost any way you'd cook a potato. They can be roasted in the oven, boiled, steamed, cooked in the microwave, sauteed on the stove, or even grilled. You can even make low-carb oven-roasted turnip French fries. They can be served raw (especially the small baby turnips), grated, cooked in chunks, mashed, or cooked with meat as in a pot roast. The only caveat is that turnips cook faster than potatoes because they are a lot less dense. Herbs and seasonings that go well with turnips include garlic, ginger, bacon, mustard, cinnamon, apples, parsley, thyme, and tarragon. Experiment with this low-carb root vegetable and see how you can replace potatoes with turnips. Cruciferous Vegetables and Cancer Prevention. National Cancer Institute. https://www.cancer.gov/about-cancer/causes-prevention/risk/diet/cruciferous-vegetables-fact-sheet.